3mm square 14k wire milled and drawn by hand. 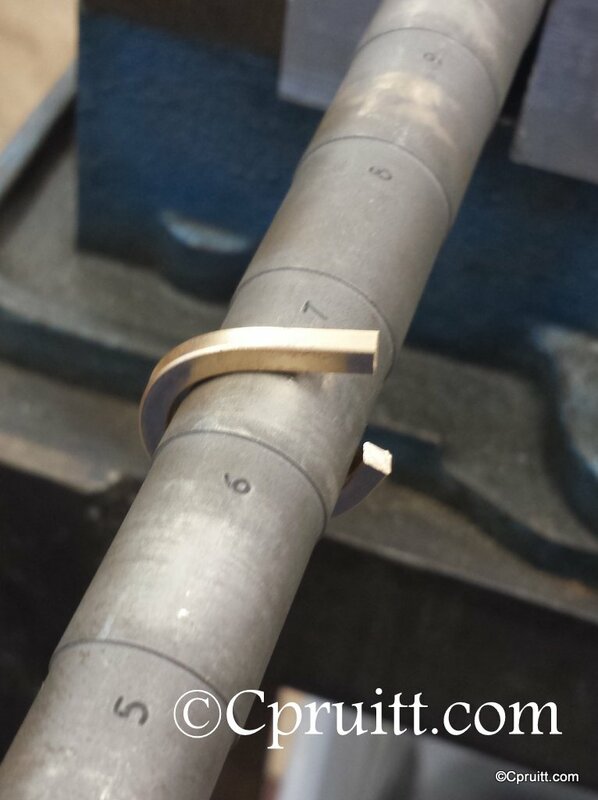 First round if bending square wire into a ring. Bending causes the metal to work harden. Vice aided in over bending wire to get a tight seam. 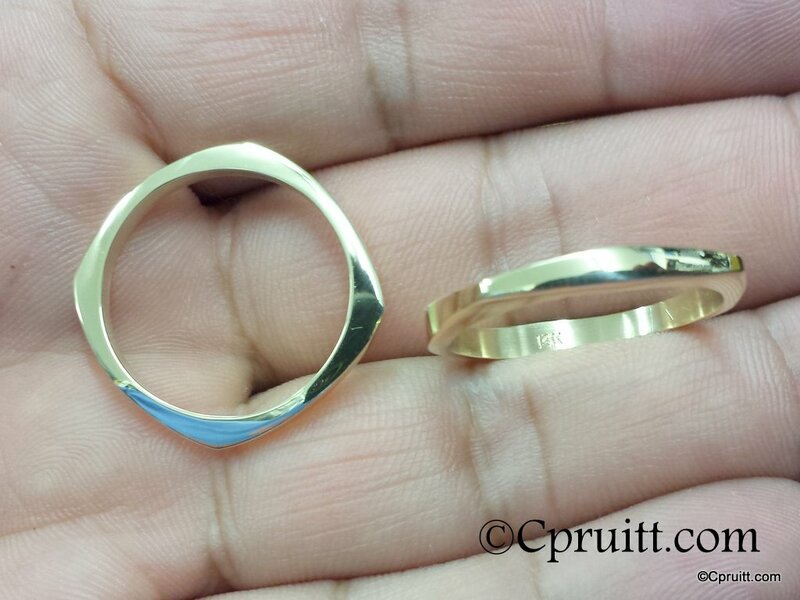 Also metal has been annealed several time to keep soft. 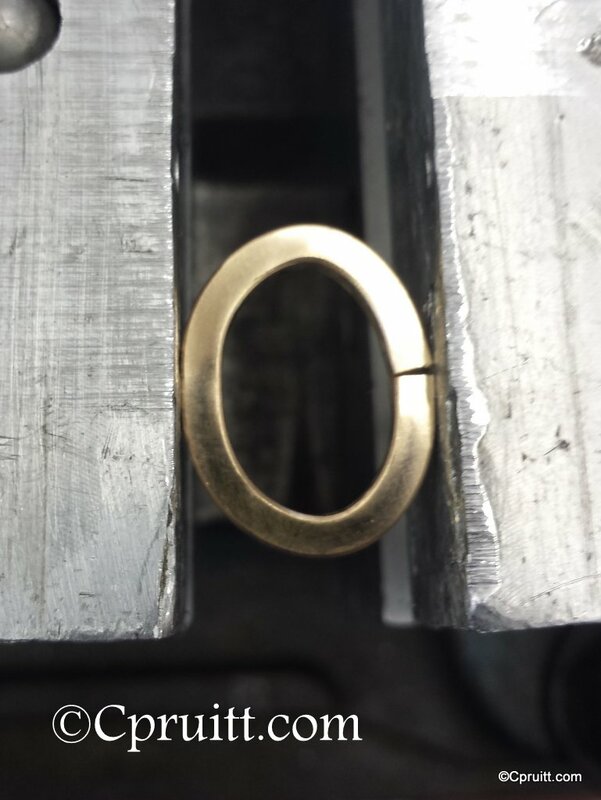 Using the vice once again to help open the ring from a D shape to a circle. Will be annealed right after. 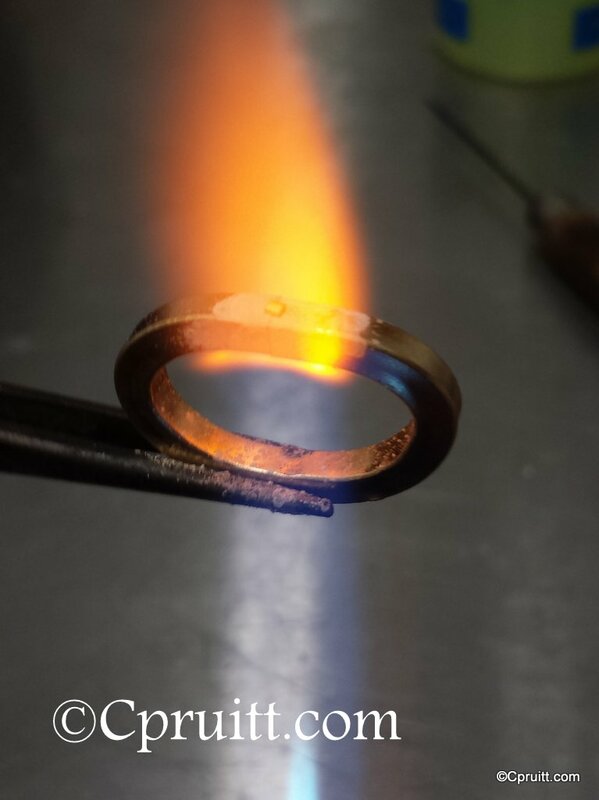 Ring opened a little more, then on to a ring bender (not photoed) to true up the ring. 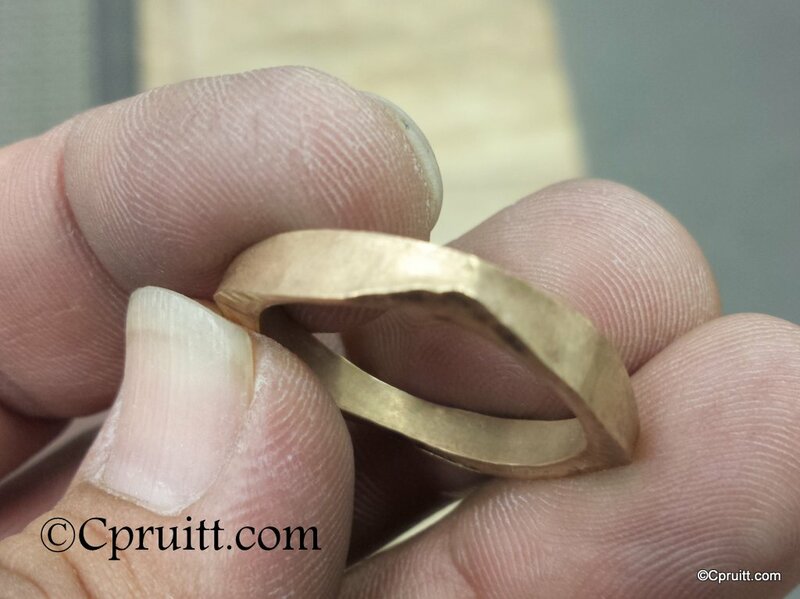 Placed on a stepped ring mandrel and using a hammer that has a slightly domed face. 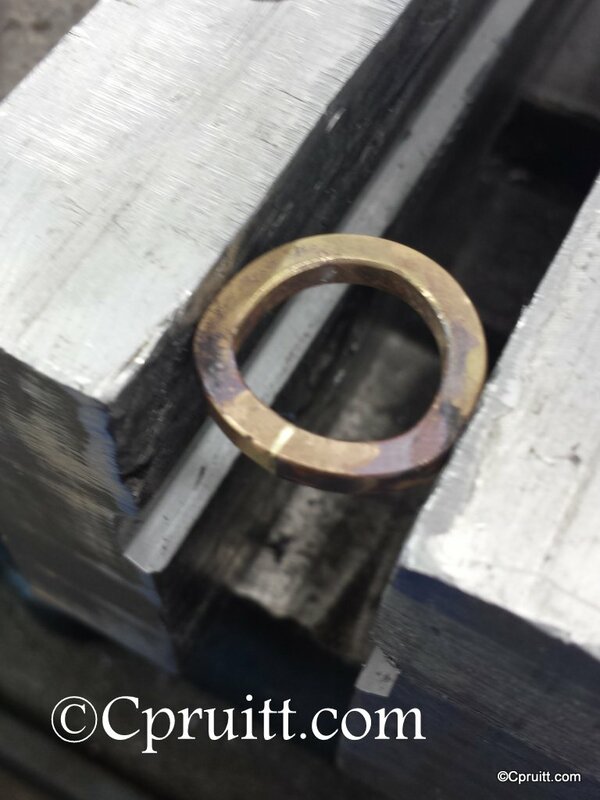 I start the first wave of planishing to move the metal into a square shape with a round center. 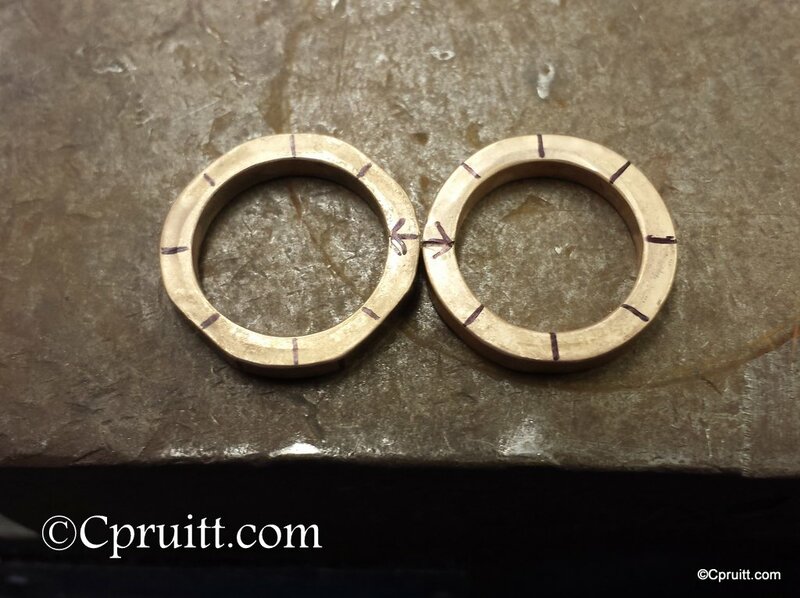 Showing the difference of planished/ cold forged rings. Marking for reference when planishing. 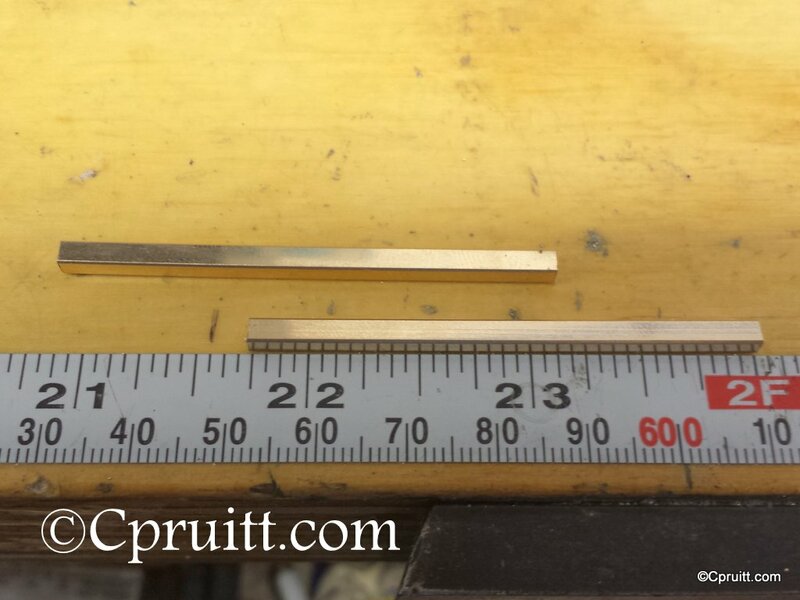 After another annealing, I move to planishing on some mini stakes. At this point Im moving the metal on the side of the ring. Thinning them out at the points. Here is the end result after planishing/cold forging. 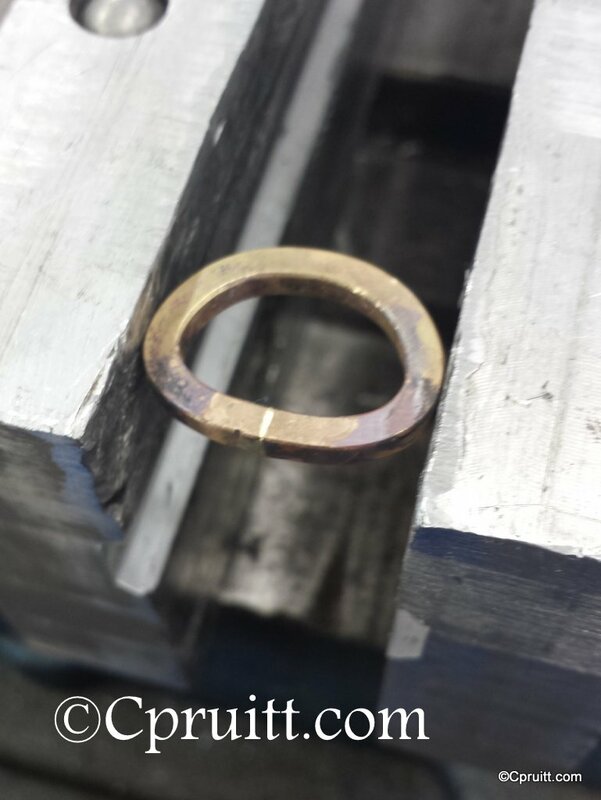 To achieve this shape the last two steps were preformed one after another for about 5 rounds, annealing after each step.. 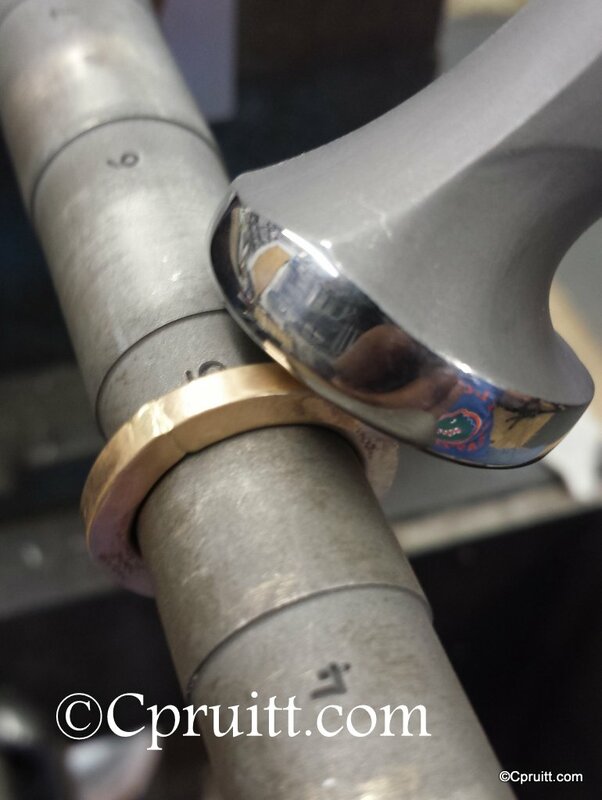 Rings ground to final shape and polished. Sorry I forgot to photo the grinding and polishing process. 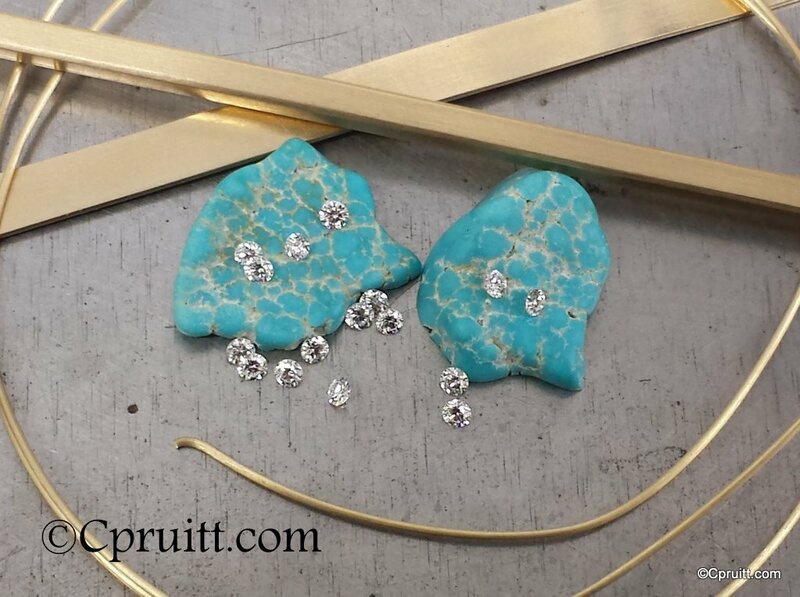 Moving on to the diamond placement, Im using dots the same size as diamonds for refrence .. the fuzzy stuff is glue.. Happy with the placement I begin to cut the seats for the diamonds. 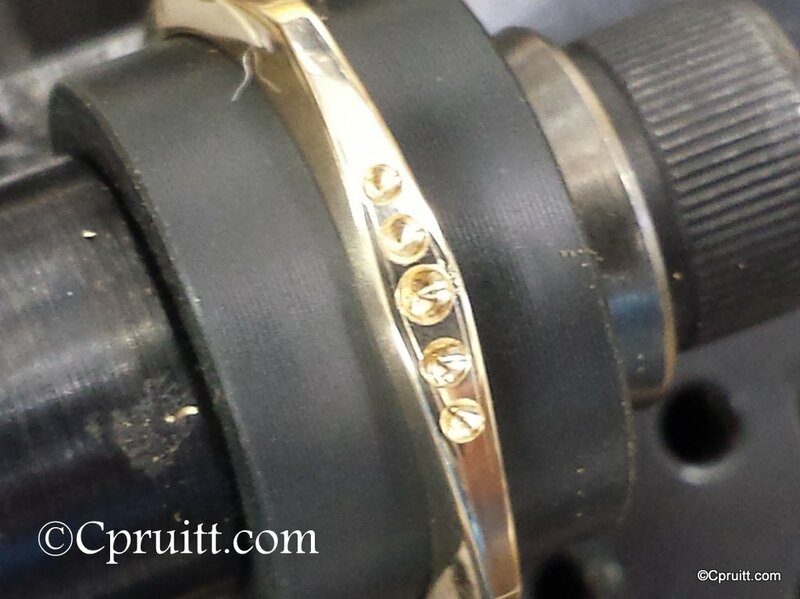 Not photographed were the beads being graved to help hold the diamonds in the seats..
After bead setting the diamonds. There are five diamonds per side, four sides to each ring, two rings total. 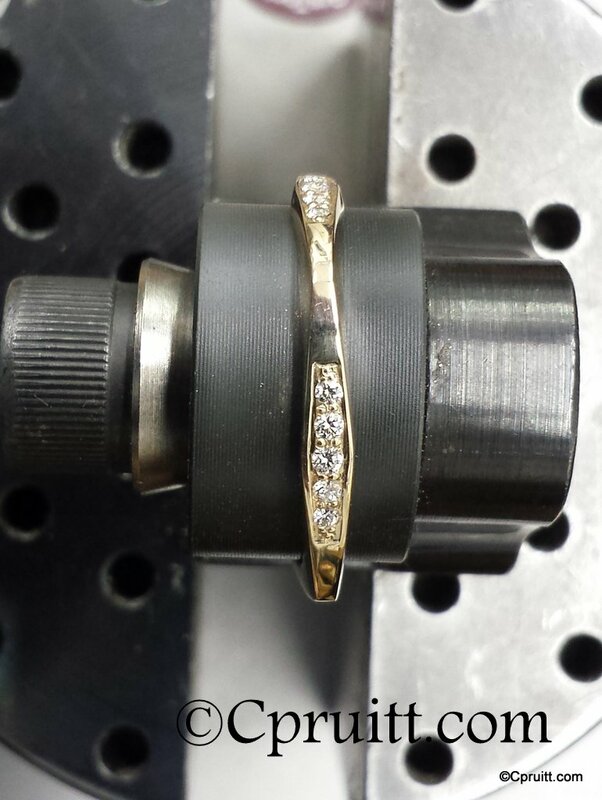 If you did the math too thats 40 diamonds total ..
Not pictured: Drilling on one end of each earring to allow a headpin to go through it and laser welded to a chain link . Giving them the ability to spin. Also not pictured; Chain making, using the wire above it was drawn down and made into jump rings once connected each link was laser welded closed. 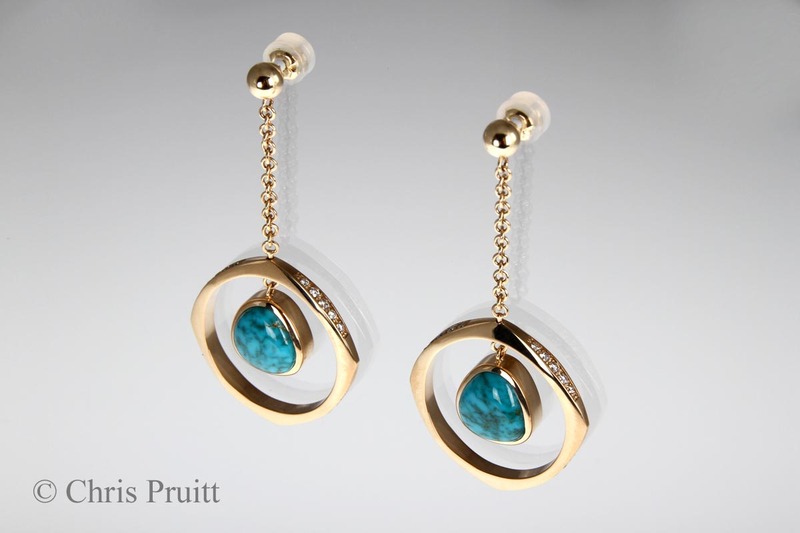 Turquoise Cabochon cut ans polished by me, a thick bezel was formed and placed on a delrin rod with double faced tape. Prior to polishng the edges are chased down with a hammer and chasing tool. The final product . 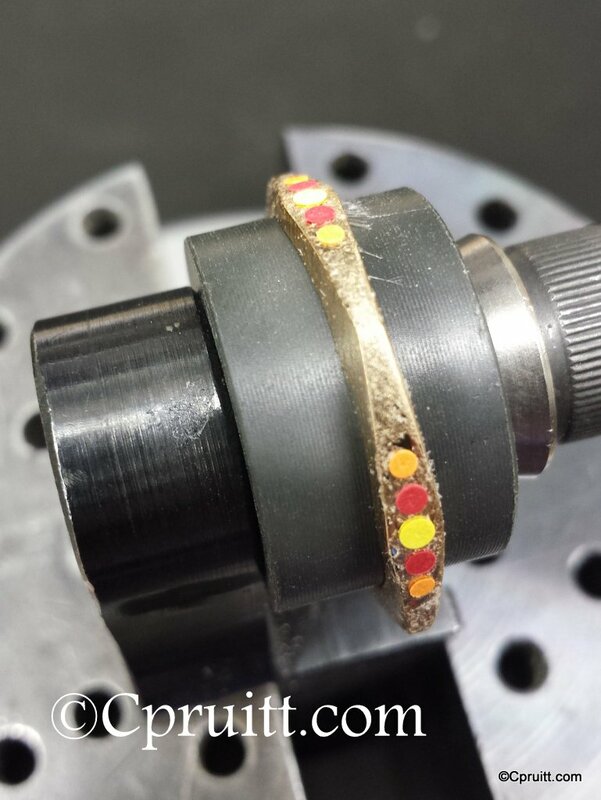 The rings spin freely and will move with wear..
Recieved 1st place at the 2014 Santa Fe Indian Market.